SportSpectator offers clear and concise guides that explain the essential elements of over 15 sports. These high-quality, laminated guides fold to a 8.5 x 4 inch brochure to fit easily into a pocket or purse, and expand to 8.5 x 20 inches to reveal a wealth of information. Read some of our product testamonials. 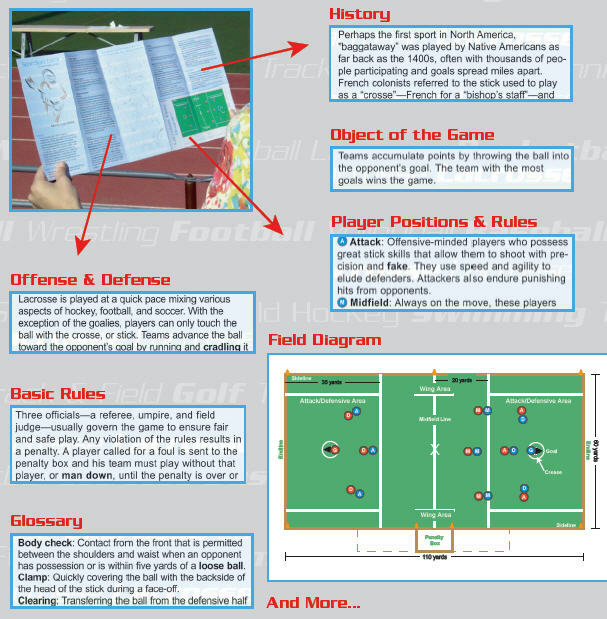 The image below shows the lacrosse guide, but there are also guides to baseball, basketball, field hockey, football, men's lacrosse, women's lacrosse, soccer, softball, swimming & diving, tennis, track & field, volleyball, water polo, and wrestling.